Human-wildlife conflict (HWC) is one of the most complex and urgent issues facing wildlife management and conservation today. Originally focused on the ecology and economics of wildlife damage, the study and mitigation of HWC has gradually expanded its scope to incorporate the human dimensions of the whole spectrum of human-wildlife relationships, from conflict to coexistence. 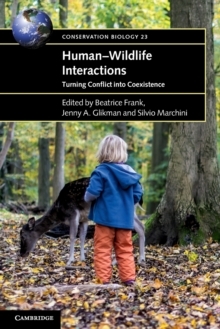 Having the conflict-to-coexistence continuum as its leitmotiv, this book explores a variety of theories and methods currently used to address human-wildlife interactions, illustrated by case studies from around the world. It presents some key concepts in the field, such as values, emotions, social identity and tolerance, and a variety of insights and solutions to turn conflict into coexistence, from individual level to national scales, including conservation marketing, incremental and radical innovation, strategic planning, and socio-ecological systems. This volume will be of interest to a wide range of readers, including academics, researchers, students, practitioners and policy-makers.